Swine influenza, or swine flu, is a highly contagious acute respiratory disease of pigs, caused by one of several swine influenza A viruses. 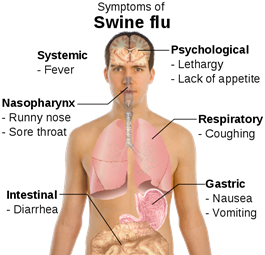 The swine flu in humans is most contagious during the first five days of the illness although some people, most commonly children, can remain contagious for up to ten days. Regular hand washing reduces the risk of contracting or passing on the influenza virus. Here at Beeswift we have a range of products to help protect and contain the outbreak of the influenza virus at your workplace. - Unique "Big Eye" design provides very low breathing resistance due to the increased filtration area. - Protection level FFP3 with exhalation valve. - Maintenance free particulate respirator. - Polypropylene (P.P) outer layer provides smooth lining and avoids loose fibres. - Soft close-cell nose foam and adjustable nosepiece ensure custom shape and increase the worker comfort and acceptance. - Soft inner face-seal ring. - Conforms to EN149 2001 . The valved masks are an excellent way to prevent contracting the swine flu virus from others. However the valved masks are no good at preventing others from getting the virus if the wearer has the virus themselves. The valve allows the exhailed air to escape the confinds of the mask unfiltered and would allow the virus particles through. America's #1 instant hand sanitizer. Kills 99.99% of most common germs that may cause illness. Works in as little as 15 seconds. No water or towels needed. Specially formulated with moisturizers to leave hands feeling soft and refreshed. Alcohol-based. PURELL® is always within reach with the PURELL Personal Gear Retractable Clip. Attaches easily to clothing. Holds a 2 fl oz pump or squeeze bottle of PURELL. Keep your hand sanitizer with you where washing your hands with water may not be possible. Example: in remote locations. To help prevent outbreaks in larger areas we have a wide range of apparel for use in washdown areas consisting of disposable boilersuits, disposable gloves and wellingtons. Any queries about the products for use in these situations should be directed to our sales department, where accurate product advice can be given.